Gourmand Award Winner – 2013 Best Eastern European Cookbook in the U.S.A.
"Delicious recipes. We used this recipe book for our traditional Christmas Eve meal this year and it was wonderful! Easy to follow GREAT BUY!" "Polish Classic Desserts (Pelican Publishing Co., 2013) is the second follow-up to his mother's efforts in spreading the word about how amazing Polish food is. Peter Zeranski and wife, Laura Zeranski, also wrote "Polish Classic Recipes" in 2011. In both books, the couple has simplified traditional Polish recipes by distilling the instructions into easy-to-follow steps geared toward Americans (ingredients are given in American measurements) that often only take up one page of a beautifully photographed book by Bob Rock. Often American authors writing about foreign foods will omit the foreign word for the recipe, but the Zeranski’s faithfully include them with accent marks! If I were them, I would have included a phonetic pronunciation, which I do in the recipes they have shared with us. For die-hard Polish dessert recipe enthusiasts, most of the desserts will be familiar but then there are a few that are an enlightenment, at least to me, among them – the Polish Filled Baby Babas Recipe. The book would make an ideal gift for a new cook wanting to recreate babcia's recipes. A rare few (I wish there were more) of the recipes have interesting anecdotes associated with them, notably the Polish Mocha Torte Recipe that the authors claim was one of the elegant desserts szlachta ladies sold in a Warsaw cafe during World War II to make ends meet. This torte is made without flour and would be perfect for those on a gluten-free diet or as a Passover dessert. There is a nice discussion of poppy seeds in an intro to the Polish Poppy Seed Torte Recipe, a two-layer cake with whipped cream frosting. In addition to the three recipes mentioned here, I also tested the Almond Cookies or Ciasteczka Migdalowe. They really are to die for -- fragile and buttery -- and remind me of my family's Polish Pecan Cookies recipe, which are further enhanced by a roll in confectioners' sugar. I much prefer this cookbook to the authors' first effort, probably because I discovered a few recipes I had never seen before. In any case, it's a good buy and would make a great gift for Mother's Day or Father's Day, for that matter. The recipes are a touchstone with the past and even if the recipient never bakes one of these treats, they will treasure the book as a direct link to their heritage." "Has all of the desserts that I loved my mom made when I was a kid. Easy to read and follow directions." "A mouth watering assortment of decadent desserts! There are recipes that cover every "sweet and confectionary" spectrum...from every day desserts to elegant delicacies that are as pleasing to the eye as they are to the palate...a delight to serve any guest. The recipes are well written and easy to follow, and many may be prepared in advance of serving. We have prepared/served several of these recipes and our guests were thrilled with the enticing desserts. Will continue to prepare these desserts for friends and family." "Whether you are of Polish ancestry or not, this cookbook is for the experienced baker, those new to baking, and those wanting to recapture the joys of past delights created by beloved relatives. Beautiful photography and cultural notes make this cookbook a perfect gift for all generations and will ensure that the joys and flavors of Polish cuisine traditions continue." "Polish Classic Desserts is a fabulous ethnic cookbook that is filled with authentic recipes updated for modern kitchens of traditional Polish desserts. The authors share these wonderful dessert recipes as a way of preserving and sharing their wonderful cultural heritage. 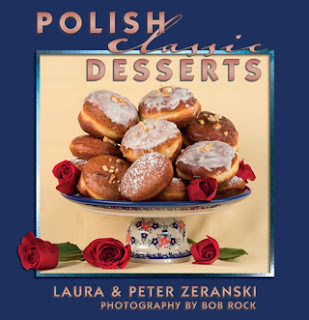 Decorated with wonderful color photographs of finished desserts displayed on beautiful Polish pottery and special dishes, "Polish Classic Desserts" is filled with mazurkas, babas, cookies, tortes, cakes, pastries and specialty desserts. There is even a chapter of special adult beverages which sometimes complement Polish desserts beautifully. All recipes are given with standard measurements, with directions using such kitchen aids as a standing mixer with a paddle attachment and dough hook, blender, etc. Some of the classic Polish desserts offered include Lemon Torte (Torte Cytrynowy), Filled Baby Babas (Babeczki Smietankowe), Gypsy Mazurka (Mazurek Cyganski), Krakow Cheesecake (Sernik Krakowski), and Filled Donuts (Paczki). "Polish Classic Desserts" is sure to fill a special niche in cultural heritage cookbooks and specialty dessert preparation. Just to look at some of the incredible photographs of finished desserts is an exploration and education of the senses. Making and serving some of these classic desserts would indeed be a labor of love." "This cookbook contains every traditional recipe that would be needed by a Polish American. It is an excellent cookbook for a Polish or Polish American grandparent to pass on to the younger generation...the selection of recipes is perfect! It encompasses all the recipes required to serve traditional holiday meals as well as every day favorites that no Polish cook should be without...I highly recomend this cookbook for all those who love to eat Polish food..this is an excellent book to give as a gift." "This collaboration is a successful showcase for both the novice cook, and the experienced cook, to have a full range of Polish recipes to try with successful results". "This book brought back those memories and a desire to make the dishes so long untasted. Easy to follow recipes and colorful photographs of each dish are accompanied by interesting narrative on Polish holiday customs, folklore and history." “Polish Classic Recipes” (Pelican Publishing) is a wee book, not quite a hundred pages. But Peter and Laura Zeranski, the husband-and-wife team that authored it, waste no time in sharing recipes that capture the essence of what makes this cuisine so special. "Designed for the modern kitchen yet retaining traditional roots, each heritage recipe has been tested to perfection. Accompanied by notes on Polish holiday customs, history, and menu pairing suggestions, these dishes offer a flavorful sample of the Polish dining experience, as passed down from generation to generation." "There are so many more recipes I’ll be making from 'Polish Classic Recipes.' I left my heritage many years ago so it’s nice to get back to eating some of the foods from my childhood. This book is a keeper and recommended to those that want to make Polish foods as a change."